Age 91, died Sunday, December 2, 2018 at Bronson Hospital in Kalamazoo. A funeral Mass will be held at St. John Vianney Church, 2415 Bagley St.; Flint, MI on May 11, 2019 at 9:00 am, Fr. Firestone officiating. Final interment will be in New Calvary Catholic Cemetery, 4142 Flushing Road, Flint, following the funeral. In lieu of flowers family suggests contributions to St. John Vianney Catholic Church or to the St. Vincent DePaul food pantry nearest you. Richard was born in Flint, November 14, 1927, the son of Ernest and Syble (Clune) Chimner. He was a founding member of St. John Vianney Church. 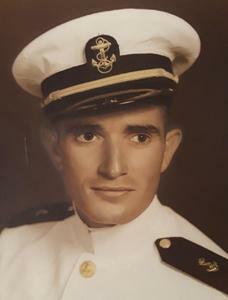 He graduated Flint Technical High School in 1945 and in the fall enlisted in the U.S. Navy, graduating from flight school at the Naval Academy in Pensacola in 1950. He married Mary Hackett in 1950 and remained in the Navy for two more years, one of them in Korea. While in the Navy, Richard studied at the Colorado School of Mines, Princeton University, and completed his college education at Purdue University. He returned to Flint to work for the IMA for 13 years as manager of their store in the GM engine plant in Flint. He left there to work in real estate for 10 years with Piper Realty, then joined First Federal S&L, and retired from there as Branch Manager for the Fenton branch. In retirement Richard enjoyed more of his favorite activities, playing cards, working jigsaw puzzles, tennis, fishing, and golf, especially the Father's Day golf tradition with his children and their spouses. Richard served as a Eucharistic minister for many years, and was also active with American Cancer Society, Knights of Columbus, Kiwanis, St. Vincent de Paul, and served as a counselor at Genesee County Jail. Richard was preceded in death by his cherished wife of 62 years Mary; sister, Carmen (Jack) Goldsworthy; and is survived by sister, Kathleen (Art) Mahon; children: Libby (Mike) Yancho, Scott (Amy) Chimner, Cynthia (Carl) Kerchmar, Mike (Rhonda) Chimner, Greg (Gina) Chimner, and Theresa (Vincent) Bray; 11 grandchildren; 13 great-grandchildren; special nephew, Steve (Angelique) Yalda; many more nieces and nephews; and his beloved dog, Maggie. The family wishes to thank New Friends Memory Care & Assisted Living Facility in Kalamazoo for the loving care Richard was given while there the last five years. Please visit Richard’s personal web page at www.BetzlerFuneralHome.com, where you can archive a favorite memory or photo and sign his online guestbook. Arrangements by Betzler Life Story Funeral Homes, Kalamazoo (269) 375-2900.